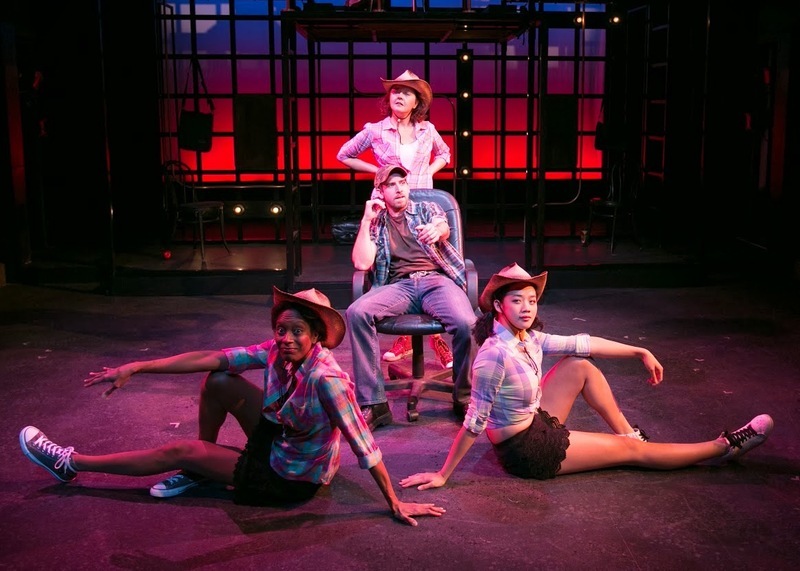 The lowdown on Working (at the Lyric Stage through February 1) is that much of it doesn't quite work - and that goes both for the musical itself and, I'm afraid, this particular production. A few years back I saw a solid version at the gone-but-not-forgotten Metro Stage that found the bruised, beating heart in Studs Terkel's source material, and so triumphed over a so-so score and episodic book. That gave me hope for this latest incarnation, a revision that attempts to grapple with the workplace of the millennium (but doesn't really address any of its underlying issues). Alas, at the Lyric, director Ilyse Robbins hasn't been quite as lucky as the Metro crowd - although she does fine by most of the spoken vignettes studding the show (and lifted, I assume, pretty much verbatim from Terkel). There's quite a bit of acting talent on tap in this cast, and so there are remarkably touching turns here from local stalwarts Christopher Chew and Phil Tayler, as well as newcomers Tiffany Chen and Cheeyang Ng. It's when the music starts that the trouble does. The band, under the direction of the reliable Jonathan Goldberg, is quite tight, but sometimes overpowers the vocals; and the revised version has dropped the catchiest number (James Taylor's "Traffic Jam"), and larded in some new, forgettable ditties by Lin-Manuel Miranda (who penned In the Heights). To be fair to Miranda, not much in the workmanlike original was all that memorable either, although at least two ballads, "If I Could've Been" (by Micki Grant) and "Fathers and Sons" (by Stephen Schwartz, the driving force behind the show) remain affecting. What's striking about the score, however, is how homogenous it is, despite being written by six different composers. If you doubt the normative powers of the show-jazz/show-pop amalgam that got traction in the 70's (and which only a show queen could truly love), look no further than the score of Working, which somehow forces a half dozen writers into the same template of inspirational hooks and 4/4 meters. Sigh. Despite all these issues, however, Working works now and then - although more often in Terkel's spoken word than in any of its songs. Christopher Chew proved nothing less than heartbreaking in the preamble to Craig Carnelia's "Joe" - a meditation on what it means to be out of work forever - and Phil Tayler shone brightly indeed as the horn-doggy homeboy of James Taylor's "Brother Trucker" (at top). New face Cheeyang Ng likewise scored as a millennial office boy whose self-esteem bordered on the delusional, while Tiffany Chen had a haunting thousand-yard-stare as a worker all but imprisoned in a luggage factory. (Kudos to the Lyric, btw, for offering more opportunities to local Asian actors with a minimum of fuss.) These superb performances were enough to make me wish I could hear the cast simply read more from Terkel, and leave Stephen Schwartz and his songwriting posse behind. The 2011 version of Working does not have an intermission. You blame Robbins for cutting it but the fault lies with your own poor journalism. Do your homework before you assign blame so arrogantly. Okay, I'll correct the text. Although you know, if I wrote the way you do, I would indeed come off as arrogant. Not to mention rude.